Needing to upgrade my spectrum analysis capability, I recently sold my trusty boatanchor HP 8558B to help finance a portion of a new Rigol DSA815-TG spectrum analyzer. Last week I was able to order the 815, and today it finally showed up on my doorstep. I first came across the 815 last year, at the 2012 Dayton Hamvention. I believe that it had just been released at that time, and I don’t recall hearing any buzz in the ham radio world about it. I was very intrigued by it, and vowed to look into it further. A bit later, videos of the 815 in operation started showing up on YouTube, which got me even more intrigued (there’s lots of very good, detailed videos available via search). The final nail in the coffin was the product review in a recent issue of QST, which was quite favorable. A quick overview of the banner specs include a 1.5 GHz bandwidth, standard preamp, DANL of -135 dBm, 100 Hz minimum RBW, and the -TG option includes a built-in 1.5 GHz tracking generator (an absolute must-buy). It comes in a compact, yet solid, portable enclosure; about the size of a larger portable oscilloscope. The LCD display is clear, ample, and well-backlit. The unit also has a nice variety of connectivity, including LAN, USB host, and USB device, as well as 10 MHz reference in and out. I had a chance to briefly run it through some measurements this evening, which I’ll share with you below. 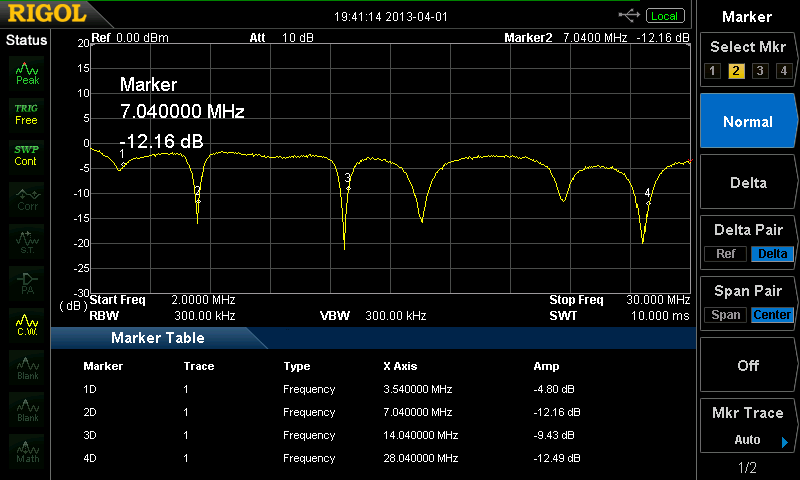 This first image is a capture of a local FM broadcast station on 100.3 MHz. 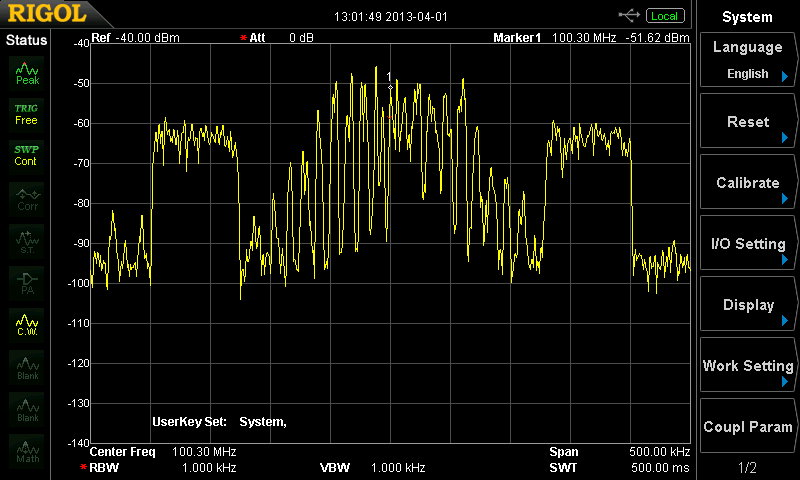 You can see the standard FM modulation, along with the very blocky digital HD radio subcarrier. The next capture is a tracking generator sweep of a narrow CW filter that I had lying in my junkbox. It only has 3 crystals, which you can tell by the fairly shallow skirts. I was concerned that the 100 Hz minimum RBW might be too limiting for measuring narrow CW filters, but by all appearances it seems to do a good job in conjunction with the tracking generator. You can also see the very handy automatic 3 dB bandwidth marker measurement, which makes the process quick and simple. 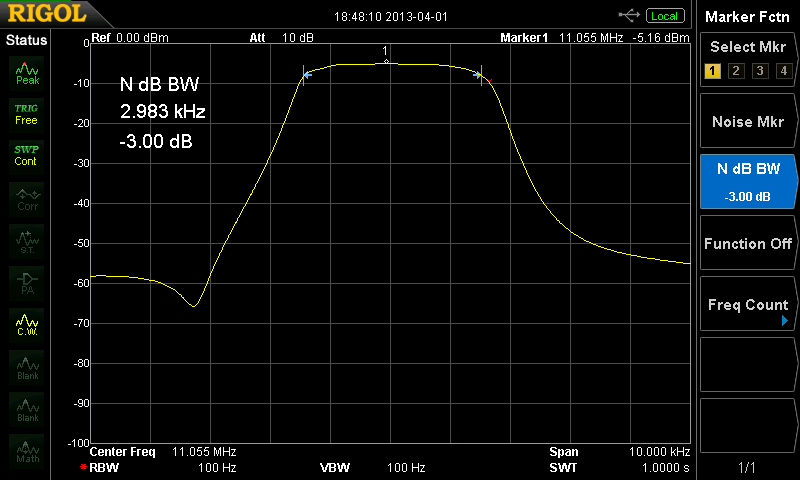 Here’s a sweep of a 6-crystal SSB filter that I also found in my junkbox. Again, you can see how useful the 815 can be with this type of measurement. It only takes a few moments to get this result once you get familiar with the basic functions of the 815. Finally, I paired the 815 with a homebrewed return-loss bridge so that I could make a wideband sweep of my main station ZS6BKW antenna. Here you can see return loss plot from 2 to 30 MHz. The resonances in the ham bands are quite obvious (some are indicated with markers). I never did any trimming on the antenna since I use it with an autotuner, but you can see that it came in pretty closely on the first try. Only having used the 815 for a few hours, I’m already quite addicted to it. It’s going to be a hugely useful addition to my stable of test equipment. I’m sure you’ll see many measurements from the 815 in the years to come on this blog. It seems, your immensely enjoying your new toy already Jason — vy FB OM! Now we’re all jealous and selling off our boat anchors too. Best to you!